Although I could use a little training when it comes to cleaning a toilet or emptying a dishwasher (my mom says I am horrible at it, but I think she's just overdramatic), I definitely feel that an apartment lifestyle will greatly improve my college experience. One of the reasons I think I disliked my first semester at Lehigh so much was really just because I couldn't stand my roommate situation. After my roommate and I both moved out and I moved in with a different girl second semester, things were better, but I still did not like that kind of lifestyle... it totally works for some people, but it just didn't work for me. Nevertheless, there were bigger reasons as to why I am not returning, so I don't want to sound ungrateful for the opportunity to go to Lehigh. Anyway, one thing that was fun about dorm life, besides being down the hall from some of my best friends, was having the opportunity to decorate a small space. The dorms at Lehigh were horribly small, even in comparison to other dorm rooms, and the cinderblock walls were far from aesthetically pleasing, but I just liked that I had a space to decorate (you can see my dorm tour here). I didn't exactly love how my dorm turned out, but I think that was partially because the dorm was so ugly that there wasn't much I could do about it. However, I loved each individual piece in my room and I had so much fun last year picking out decor. I love getting excited about these things, and I think shopping for small spaces can be so much fun! I am so excited to be decorating an apartment this year, I can hardly stand it!!! Be on the lookout for more posts like these... I won't be able to resist! 1. A 5x7 or 6x8 rug is usually the perfect size for a dorm room! Which size to get really just depends on the sizes of the rug you're looking at. For a living room in an apartment, I would say the same rule probably applies, unless you're looking for something to fill a large portion of the room, in which case you might like an 8x10. 2. Minted has amazing tools for building a gallery wall. Not only do they have a ton of print options, but you can also purchased prints framed! All of the prints that I will be using are courtesy of Minted, but I picked out the frames somewhere else... the prints aren't what gets pricey, just the nicer frames, which I don't think college students really need to splurge on anyway! I have recently picked up frames at Michael's and Target (love these). Try your TJ Maxx for inexpensive frames as well, and Etsy for more prints! 3. Dorms and apartments are notorious for cutting you short on space, which is why getting creative with storage can be really important. 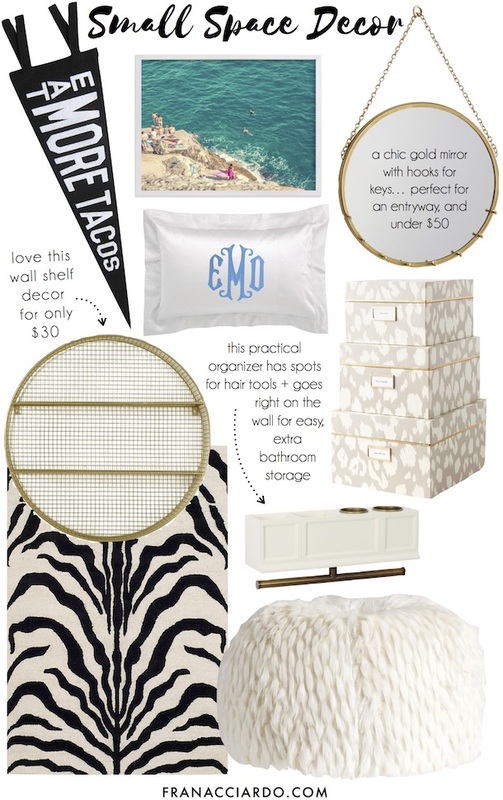 That's one reason why I love that circle wall shelf decor piece in the collage above, besides the fact that it's just super cute. It would be so easy to blend that into a gallery wall above your bed and use for typical nightstand essentials, or even perfect for an entryway if you were to skip a table and put your keys and things on this instead.If you have shared photos of your dorm or college apartment anywhere online, please share a link below! I would love to get more inspiration from you guys, and I would love to hear what pieces you have found to be essential to your small space. I love everything you picked out. Pennant flags are the best. I love seeing collections of them. So excited for you Fran! Next year is gonna be awesome! Also, love your new blog design. So cute! Very exciting choice!! My tip to you for dorm/college decorating is to avoid the white/cream bedspread and pillows and go for darker colors instead... whites look great online but often clash with the standard off-white paint that comes in these buildings and show everything. Deep purples and blues with metallic accents keep it sophisticated. Also, consider getting adjustable curtain rods and sheer curtains to liven up windows! Super inexpensive and it is the number one way to make a room feel like home. Everyone who sees my room comments on them!